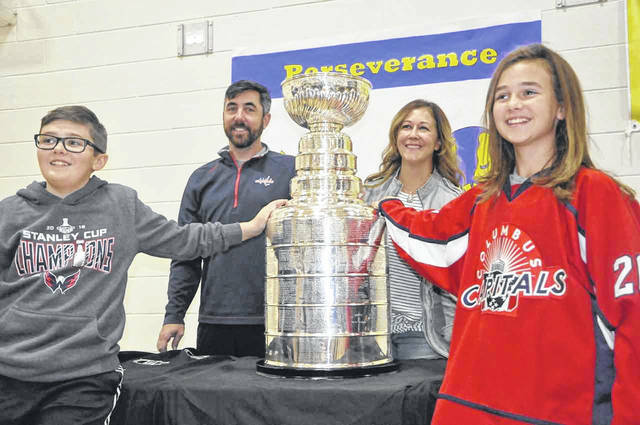 Washington Capitals Director of Hockey Operations Kris Wagner, along with his wife, Jenn, and children, Ty and Addie, pose with the Stanley Cup during its stop at Shanahan Middle School on Friday. Shanahan Middle School Principal Josh McDaniels jokes with his students about having their phones out in school as he wheels the Stanley Cup closer for pictures. Students and faculty at Shanahan Middle School in Lewis Center were treated to a unique experience as the Stanley Cup made a visit to the school as part of a Friday assembly. Students listened to motivational messages centered on perseverance from Principal Josh McDaniels and Spanish teacher Ashlee Ralph, who shared her story of hardships and handling cerebral palsy throughout her life, before lining up to have their picture taken with the Stanley Cup. The Cup, arguably the most recognizable trophy in all of sports, was on hand thanks to Kris Wagner, the director of hockey operations for the 2017-18 World Champion Washington Capitals. Wagner’s two children, Ty and Addie, are students at Shanahan. A tradition of winning the Stanley Cup Finals calls for players and staff to each receive their own personal day with The Cup, which Wagner graciously elected to share with the school. Wagner, who hails from the Youngstown area, began his journey to becoming the director of hockey operations for a world-champion organization at Kent State University, which at the time, had a Division I hockey program. After KSU dropped their hockey program, Wagner transferred to Bowling Green State University, where he majored in sports management. He jokes his physical frame didn’t lend itself to a future playing the game, but sports management was a way to be involved in the game he grew up loving. When the time came to do an internship, Wagner said he applied to every United States franchise in the National Hockey League. With multiple offers in hand, he chose to intern with the Washington Capitals. What Wagner thought was simply an internship would ultimately lead to a world championship ring and his very own day with Lord Stanley’s Cup. Upon reminding them his internship had ended, Wagner said he was asked to come back for a part-time position. From there, he moved up to a hockey operations assistant, then to the director of scouting operations. After Wagner and his wife, Jenn, had their two children, the family moved to Columbus while he was still traveling the world as the director of scouting operations. After the Capitals changed management ahead of the 2014-15 season, Wagner was promoted to his current position as the director of hockey operations and capped off his 20th season with the franchise by hoisting the Stanley Cup last June. Wagner said his fondest memory of winning the finals was the parade that followed when the team returned home to Washington, D.C.
With the 2018-19 season now underway, Wagner feels the experience of last season has the entire organization prepared to get back to the top.